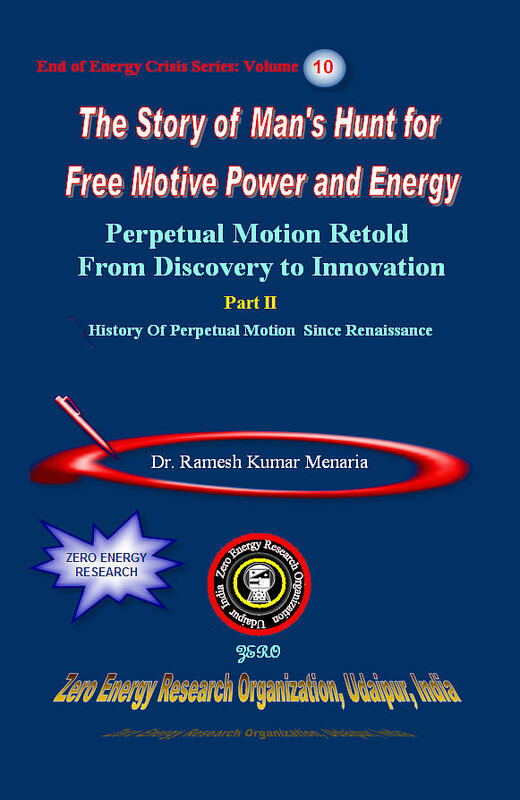 The Story of Man’s Hunt For Free Motive Power and Energy, Perpetual Motion Retold, From Discovery to Innovation. ......Around Renaissance, science and religion were in conflict in Europe. Scientist found fallacies in religious doctrines based on faith, on the other hand, priests were not prepared to accommodate new knowledge claimed to be based on rational observation and experiments with nature by scientist that challenged doctrines of religion. At this point, I would like to say that, owing to the particular limitations of religion and science and conflict between them, there arose a third group comprising of self-styled, energetic and ambitious people, this group was dissatisfied with both of them. This group of people also wanted an answer to the fundamental questions of life and the universe, an absolute answer in the form of a working reality by creating devices by imitating diverse mechanism of nature to accomplish a particular task. They were dissatisfied with religion because, although it gave such an answer, it was not one that appealed to reason. It appealed to faith. But when they turned around and looked at science, although it gave answers that were verifiable to some extent and appealed to reason, those answers were not always correct and absolute. Research had still not reached the fundamental level of reality. To describe reality of working of universe, scientists advanced clock metaphor that required rewinding by god. This was rejected by perpetual motionists in favour of their metaphor of perpetual motion machine which freed god from labors of the rewinding the world machine as they discovered a self propelled, self regulated and self sustained universe. This group did not want to wait for science to provide answers, instead they themselves attempted to find an answer to those fundamental questions through reasoned consideration and invention, without the need for theoretical framework. This group of people was best represented by ancient alchemist, practitioners of Natural Magick, perpetual motionist and virtuoso. This book presents you complete history of perpetual motion since Renaissance during which perpetual motion developed in an atmosphere of freedom, by this I mean, there were no fallacious laws of science to suppress the zeal of the perpetual motionist. Perpetual motion invented by Edward Somerset, Cornelius Drebbel, Orffyreus and many more other inventors have been discussed in a critical manner. The volume provides a rich and lively account of alchemists, perpetual motionists and their writings. Many among them were unacademic, unscrupulous, unprofessional, turbulent, and unsettled. In medieval times their “Natural Magick” in all diverse forms, including perpetual motion and alchemy, paved the way for the development of science at great lengths. Volume also deals with patent history of perpetual motion and describes various patents filed during 17, 18 and 19th century…..
How To Judge Marquis Of Worcester Works? In Bonum Publicum & Ad Majorum Dei Gloriam. Marquis Of Woecestee S Patent. Signet Bill. A Panegyric by James Bollock. Devices with Tremendous Mechanical Advantage Nos. 14, 22, 27, and 93. CHAP. XIV. The seeming probability of Effecting a Continual Motion by Solid Weights in a Hollow Wheel or Sphere. How Can You Patent A Perpetual Motion Machine? Desaguliers’ Article Rejects Orffyreus’ Invention Remarks On Some Attempts Made Towards A Perpetual Motion; By The Reverend Dr. Desaguliers, F.R.S. CHAP. XIII. Concerning several attempts of contriving a perpetual Motion, by Magnetical Virtues. CHAP. XV. Of composing, a Perpetual Motion by Fluid Weights Concerning Archimedes his Water Screw the great probability of accomplishing this enquiry by the help of that, with the fallibleness of it upon experiment. Device of Author of the "Voice of Reason"
Device of "Ed. Vocis Rationis"
6 DEVICES UTILIZING CAPILLARY ATTRACTION AND PHYSICAL AFFINITY. CHAP. IX. Of a Perpetual Motion, The seeming facility and real difficulty of any such contrivance, The several ways where- by it hath been attempted, particularly by Chemistry.